Hideo Gosha's early film The Secret of the Urn proves that a storied, eye-grabbing antihero can't always power an entry in samurai cinema on his own, even if he comes rather close to doing do. With a scarred face and a nasty snarl, let alone one of his arms missing, watching Japanese legend Kinnosuke Nakamura cut through enemies in Gosha's distinctive no-frills sword duels can be an exhilarating experience, easily the central draw to this bald-faced escapade. Though instead of the thoughtful ruminations that populate the director's yakuza pictures Onimasa and The Wolves, or his daring flare with Sword of the Beast, Gosha settles into a ho-hum script here with trivial periphery characters and a forced back-story, crafting an amusingly rowdy but ultimately one-dimensional yarn around a well-explored hero. 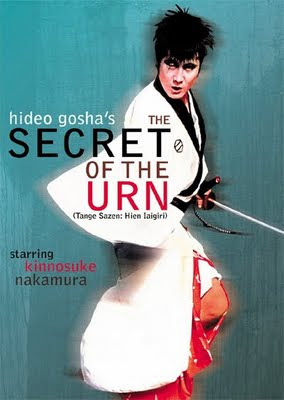 The Secret of the Urn first introduces Samanosuke (Kinnosuke) as a loyal samurai to the Yagyu clan, who surprisingly finds himself on the wrong end of the blade during an assassination assignment, leaving him disfigured by way of a missing arm and eye. Cut to a year later, where the Yagyu fief have the opportunity to raise their prestige by being selected to provide a hefty sum of money to the Shogunate, something that doesn't sit well with a rival family. A search sparks to locate a legendary urn - the "Earless Monkey Urn" -- that supposedly leads to roughly a million ryo, which both sides obviously want to get their hands on. While in the fray of battle, the urn falls in the hands of the one-eyed, one-armed, scowl-faced Tange Sazen, along with a pair of thieves that catch wind of the urn's worth. The unsavory union between them falls into place, until Sazen's childhood friend Hagino surfaces. The character of Tange Sazen appeared in several films and books throughout the '20s before Hideo Gosha directed The Secret of the Urn, which serves as a new origin story for the character. With an eccentric tone and one arm tucked in his garments, Kinnosuke Nakamura discovers an exaggerated petulance that fits, even if his brash overstatement bloats bigger than some scenes can handle. His relationship with his female companion, Ofuji (Keiko Awaji), approaches that of the doomed anti-romantic connection between a roguish man and an unsavory woman, and it hits melodramatic weeps and bickering that rings fairly hollow through bluntly-scripted dialogue. Gosha and his recurring writer Kei Tasaka take potentially intriguing characters and, ultimately, create a vigorous but dry fable of double-dealing and antiheroic jadedness, one obviously more concerned with catering to an icon of Japanese culture. While only scratching the surface with character depth, The Secret of the Urn makes up for it in the sparse to-the-point battles Gosha orchestrates. Obviously, one of the big draws to a story of Tange Sazen comes in the one-armed fighting style that the ronin exploits, and it's handled with an animated flare that fits Kinnosuke almost like a glove. Photographed by Sadatsugu Yoshida, who would later shoot The Yakuza Papers with Kinji Fukasaku, the cinematography carries as much flowing energy as the picture's spirited pacing during heavier blade duels, gaining intensity and a burst of color when approaching the film's robust climax at the Shogunate tea party. With Gosha's direction and seamless eye, the fierce battles rarely cut away from healthy doses of blood-spilling, finding an energetic body-count and a fury of crowd-pleaser turns that throttle the pace all the way to the rewarding finale.